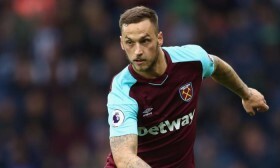 Austria international Marko Arnautovic has returned to first-team training with West Ham United despite the uncertainty surrounding his future with the club. The forward appeared on course to leave the Hammers earlier in the month after Shanghai SIPG lodged a £35m bid to lure him to the Chinese Super League. However, the package was swiftly knocked back by the Hammers and Evening Standard reports that they are unlikely to sanction his sale unless their £50m asking price is met. Arnautovic was left out of the matchday squad against Bournemouth last weekend due to the transfer interest, but he could return to the mix for the FA Cup fourth round tie against AFC Wimbledon on Saturday night. The Hammers are widely expected to get the better of their League One opponents, who have a midweek league game against Fleetwood Town in the lead up to the Cup encounter.